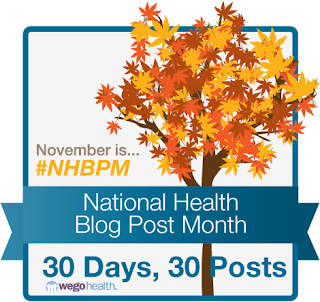 National Health Blog Post Month topic for today: Write a post about the weirdest thing about your health. Regular readers know the answer to that: pretty much everything is weird about my health. Lupus makes no sense whatsoever. Retaining fluid causes me headaches - at the same time as I suffer from eyes so dry that they hurt. Cold causes me physical pain, and heat leaves me exhausted. I get so tired I sleep almost all the time, but at times am kept awake all night because of pain. My immune system is over-active, but I catch every bug that goes around. The joints on my left side are almost always sore - but every now and then they're fine and my right side takes a turn. I'm clumsy, and I walk into things and drop things. And although my brain scan looks normal, half the time I can't think, and even paying the bills is too much for me, to manage. There's some great Christmas gifts available from businesses in the Business Directory. 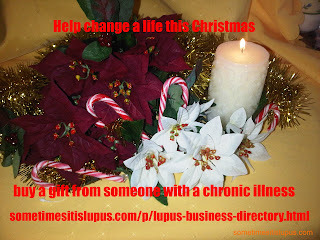 Any time you buy from these businesses, you help someone with a chronic illness towards financial independence.